For Ursula de Jong, her life and career has been more about embracing the richness of life, being open to serendipity and seizing opportunities than strategy and careful planning. I am writing this letter on an early spring afternoon, in a coastal garden on the Nepean Peninsula, on the tip of the Mornington Peninsula, Victoria, Australia. The birds have come to drink and bathe in the bird baths: the blue fairy wren and his harem; the wattle birds; New Holland and yellow faced honey eaters; eastern spinebills; blackbirds; pigeons and doves; the song thrush and cheeky fantails. Each waits their turn. Ever watchful. Hanging bower spinach and untamed rhagodia provide safe havens under the old gnarled tea trees. Nesting. Birdsong is their gift. It has been a privilege to create and care for a garden contiguous with a bushland reserve, nurturing biodiversity through habitat corridors. Crawling on hands and knees while working with the Friend’s Group has meant learning about our indigenous environment on the ground – through weeding and planting. Being patient. Spring is particularly rewarding with correas, leucopogons, prickly wattles and tea trees in bloom, with the pink fairy orchids and dianellas out and the sprawling perennial coastal herb swainson pea making a purple statement. Learning to see, to know, to appreciate the Nepean Peninsula has taken time; a casual invitation to be involved in a Friend’s Group decades ago has turned into a compelling need to care for place, to work with others, to stand up and speak on behalf of the natural and cultural values of this distinctive unique beautiful coastal landscape. Volunteering and working with communities is enormously rewarding and admittedly, at times, frustrating. I see now that the seeds of so many of the things I have undertaken or been involved in were sown very early in my life. I could say to you, “Be strategic, plan your career”, but if I am true to myself I have to simply say, “Embrace the richness life has to offer, remembering always that you are who you are not what you are”. You are a first-generation Australian, first-born daughter of Polish/ Swiss immigrant parents, who valued Australia for offering them a chance of a new beginning, following the ravages WWII had inflicted on Europe: physical and psychological. The notion of a new beginning is not on the horizon of a child where every experience is centred in a world created by family, friends and neighbours. You were shaped and nurtured through love. You are bilingual. You grew up knowing Switzerland, Poland and Europe intimately: traditions, stories, food and music led to particular ways of knowing. Your parents struggled willingly to create a home in Australia, to grow an abundant productive garden, to work hard and slowly come to appreciate this dry sunburnt continent, a land of drought and flooding rains, of a beauty beyond compare, where seasons were always upside down. “New” Australians were embraced by “old” Australians in the suburb of Oak Park. You were joined by a sister and a brother. Neighbourliness formed community, became family. Cultural diversity and inclusion, sharing and caring were part of the everyday. You were firmly grounded in place: you walked to kindergarten; to church; to the station to train to school; watched the flooded Moonee Ponds Creek from the safety of the carriages; had bread and milk delivered every day (the magpies invariably syphoning off the cream if you were not early enough); the post came twice a day, letters the lifeblood of keeping in touch – celebrations and funerals. Mutti sewed and knitted all your clothes, even your school jumper! Being different meant not always fitting in, observing, taking much in, even on your first day of school. Talking when you had something to say. In adolescence the relocation of Papa’s factory workplace from north of the Yarra to south of the Yarra was an incredible wrench: school, ‘family’, friends and neighbours were left behind. Excitement tinged with so much sadness – yet you still did not associate these feelings with your parent’s move across the world. You were self-centred, your world changed. You loved school and always wanted to be a teacher. You did not necessarily know what that meant or what it entailed, though you were fortunate to have some wonderful women as role models. Bentleigh OLSH College was welcoming, and you thrived. The nuns were gifted women full of energy, encouragement and laughter, and nurtured a love of learning in you: Sr Petra, English; Sr Monica Mary, Biology, Sr de Porres, Maths; Sr St Anne, Art and History. Sr Theresia, whose mantra “once you give up learning, you should give up teaching”, has never been forgotten. You were elected prefect, then head prefect, and so took on leadership roles at the College and also in Christian youth clubs. Formal education was augmented by the ABC radio’s Argonaut’s Club, Mondays to Thursdays. It helped develop and focus your passions for literature, art, music and nature. You were Golden Fleece and Bar Edessa 17 – Greek mythology became part of your being. University beckoned – an Arts degree is an all-round foundational degree in the liberal arts. You were the first in your family to go to University, supported by a teaching scholarship and living at home. Doors opened into so many worlds: you devoured lectures, books, ideas, were shy to really engage in seminars. Lived in the library. While freedom of expression was encouraged, assignments were bound by regulations and expectations and you found that staff did not always like to be really challenged, especially not in politics! Idealism, great in theory, has stuck with you. It was contemporary German literature that challenged you to learn to think for yourself. It is a real privilege to be offered a place at University. Education is the key to the future, no matter what you study. If you decide you have begun with the wrong degree for you, do well, learn, and move sideways! No units are wasted; you can learn something from every lecturer and tutor, even if you do not agree. Sound argument is the lifeblood of lively discourse. There is time to dream, to explore, to join student clubs. Indeed, often your fellow students offer the most creative and exciting opportunities for in-depth discussions, heated debates, reviews, crits, fun, outings – allowing you to grow as a young adult. Many will become friends for life. Eddy, physicist, philosopher and dreamer becomes your soulmate and life partner. You never know what life has to offer or what life will throw at you. Falling in love, becoming pregnant, getting married, beginning a new life – all a bit of a whirlwind. Grad Dip Ed still to be undertaken, teaching rounds and placements. Needing to believe in yourself becomes paramount, with life’s journey having taken a detour with a few extra twists and turns. You grow with your husband, sharing your life with others. Tanya Alyssa – a wonderful healthy baby daughter to care for, so much to learn, the intensity of being a mother is overwhelming. A life of juggling begins. Motherhood and developing so many new skills. You are beginning to understand your parents a little. Mutti a wonderful support, a fount of knowledge and wisdom. Papa suffers a massive heart attack and dies. Mutti becomes a widow. You and Eddy make the decision to work around family: he works two jobs, teaching during the week and in his parents’ liquor store on weekends. You stay home. We move from a flat to a house with a garden, becoming a young family with a mortgage. We welcome a second daughter – Jacinta Maria. The loneliness of being a young housewife engulfs you. You go back to University part-time – Monash has finally established a Visual Arts Department. You study every unit on offer – excelling in art and architectural history. You undertake honours and then begin a PhD. Your third daughter – Lisa Josephine – is born three months into your candidature. We are the proud parents of three beautiful little girls. Being a writer, a creative person, a researcher and a teacher just becomes more and more interesting. You see things others do not see, the world as a gift; the garden becomes a reflective, nurturing place. Fruit and vegetables thrive in an indigenous garden, with seasonal flowers. A family place to work, play and grow. You develop a holistic approach to life, to love. Experiential learning becomes ingrained. Understanding and empathy come with experience. You become part of community: church, kindergarten, school and neighbourhood. Volunteering across diverse communities over many decades has led to an appreciation, valuing and respecting of people from all walks of life. Every person has a story to tell, a contribution to offer. You do not have all the wisdom – every person has a little wisdom. Collectively a great deal can be achieved. Learning to listen to people, to different points of view, has been incredibly hard but wonderfully beneficial. It has helped in communicating better with family, friends and community, professional and work groups. The art of listening helps you succeed in every area of your life; it is tied to care and consideration. However, you also need to develop confidence in yourself, and be able to trust others. You do not need to be perfect! In trying to achieve a life/work balance you can do anything and everything – but not all at once. You need to learn to say no, to delegate, to focus. You can do a lot, but you need your circle of support: family, friends and colleagues. People who have your best interest at heart, who will be honest with you. Eddy has been that sounding board, that rock, that gentle voice of reason, that peel of laughter that lightens any day. Tanya, Jacinta and Lisa, now juggling their own families and life/work balance are founts of wisdom anchored in the real world (gorgeous high-achieving professional women who have learned much from their proud mother!). But seriously, you need to be gentle on yourself; learn to relax, swim and take a walk in the wild coast National Parks more often. Stop a while. Accept the gift of a smile and pass it on. Leadership has come slowly through involvement, engagement, invitation, even putting your hand up. The confidence of your parish community saw you become a member of the parish council, then its chair for six years. Stepping into the unknown was a life-giving transformational experience because you were willingly supported by others: the pastoral team and the wider parish. You learned so much about faith, and life, and community and what constitutes leadership. You learned about models of leadership and saw that you thrived on the model of Sarah’s circle rather than Jacob’s ladder. Not an easy pathway working within the patriarchal Catholic church! Sarah’s circle offered an inclusive and generous style of leadership, rather than a hierarchical exclusive model, and enabled the parish council to motivate the community of 2,500 families to act towards achieving a common goal. By empowering families to participate and work together, we create an inspiring shared vision of the future and implement it. What was hard was translating and accommodating such an inclusive model of leadership into the University bureaucracy, where you had taken a part-time academic position. Attending a “Women in Leadership” conference gave you the confidence to apply for promotion and begin to take on positions of responsibility. You learned that having a voice at the table is powerful, even if you were appointed, or approached, because you were a woman, and they needed to fill a quota. Regardless, you have a voice. You have the opportunity to stand up for principles and values, for equity and inclusion; you are able to raise issues, to argue a contrary point of view. You discover that influencing change from within is possible. A former Victorian Premier, Joan Kirner, tells you that the only way to effect change is to enter politics. That is not a path you are comfortable with – but you become a bold advocate. An advocate for natural and cultural heritage, for the environment and biodiversity, for place, taking on the Presidency of the Nepean Conservation Group, the Deputy Chair and Director of the National Trust of Australia (Victoria), and appointments to numerous ministerial committees dealing with Victoria’s National Parks. In the role of Associate Head of School in Teaching and Learning, in the School of Architecture and Built Environment at Deakin University, inclusive education was put on the agenda. As GEDI Director, you advocate for gender, equity, diversity and inclusion. You mentor younger staff. You are a project leader in the Deakin research group HOME, championing a home for all. So, be open to serendipity, and seize opportunities. Three grandchildren have taught the art of slow walking. Slow cooking has become part of our everyday language, but slow walking is a new concept. Destination becomes irrelevant when walking in the National Park with a child. Everything is fascinating; everything is a new discovery. So, we stop to watch bull ants warring; to pick up a stick because it is the shape of a feather; to examine the tiniest red and yellow Bush Pea flowers; to take a handful of sand and wonder just how many grains there might be in the whole world; to climb a tree or a rock; another stone goes into the pocket collection; fingers squeeze Seaberry Saltbush and make a red staining juice; bower spinach makes a secret hidey hole – a place to encounter an imaginary friend; and white Leucopogon berries are delicious, in spite of the huge pips. We were going to see the crashing surf rollers of Bass Strait. What does one learn? That a good laugh does wonders; to cherish each and every day; to be grateful for every moment shared; that a walk in a National Park is full of wonders. Dr Ursula de Jong is an Associate Professor in the School of Architecture and Built Environment at Geelong’s Deakin University, an academic, architectural historian and place researcher. She was Associate Head of School (Teaching and Learning) from January 2014 to January 2018; she is now Director of GEDI – gender, equity, diversity and inclusion. 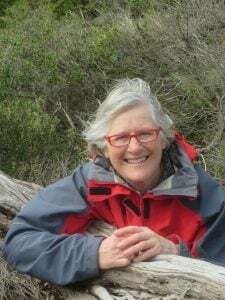 She is Deputy Chair of the National Trust of Australia (Victoria); President of the Nepean Conservation Group Inc; member of the National Parks Advisory Council, member of Point Nepean National Park Management Advisory Committee; member of National Liturgical Architecture and Art Board. She is a full international member of ICOMOS and founding member of SAHANZ.